SUPER. HOT. SUPER. HOT. SUPER. HOT. SUPER. HOT. SUPER. HOT. SUPER. HOT. But if you missed the zeitgeist: It’s a first-person shooter, except time only moves full-speed when you move. Stand still and everything slows to a crawl. Bullets hang in the air, red trails stretching out behind. People are practically motionless, frozen mid-charge. Lucky for you, because the odds are overwhelming. You’re a one-man army, taking out anonymous red enemies en masse, watching bullets idly twirl past your skull, exchanging shots with statues. Pause. Running out of ammo and then throwing your gun at the nearest foe, putting him off guard just long enough for you to sneak in a punch. Pause. Grabbing his pistol out of the air as he falls. Pause. Spinning and shooting two more who’d snuck up behind. Pause. Dodging out of the way of two bullets arcing your direction. Pause. This start/stop rhythm is the core of Superhot—more puzzle game than first-person shooter, more The Matrix or Equilibrium than Call of Duty. And that core’s been carried over largely intact from the original demo. 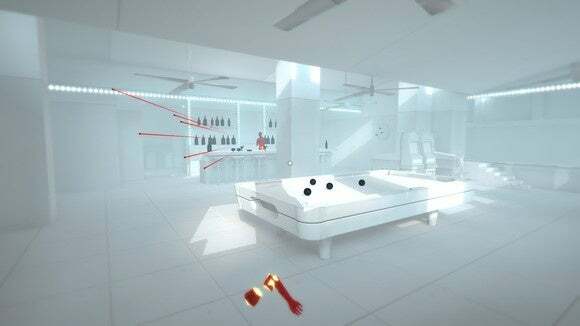 Superhot in 2016 plays much the same as it did in 2013, though there are now thirty-odd stages to play through. (The demo had three.) Office buildings, alleyways, bars, mansions, border crossings—they’re all represented here, though the setting is largely inconsequential. Your goal is the same regardless. 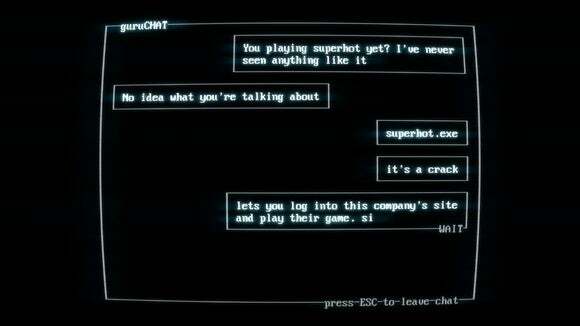 Still, I’m impressed how much story Superhot is able to wring from a bunch of mute, featureless dolls. One level, for instance, starts in an elevator. Three baddies slowly raise their guns to aim at your head. There’s no time to think—you steal the gun from one, dodge a bullet, shoot, and your slow-motion battle commences. 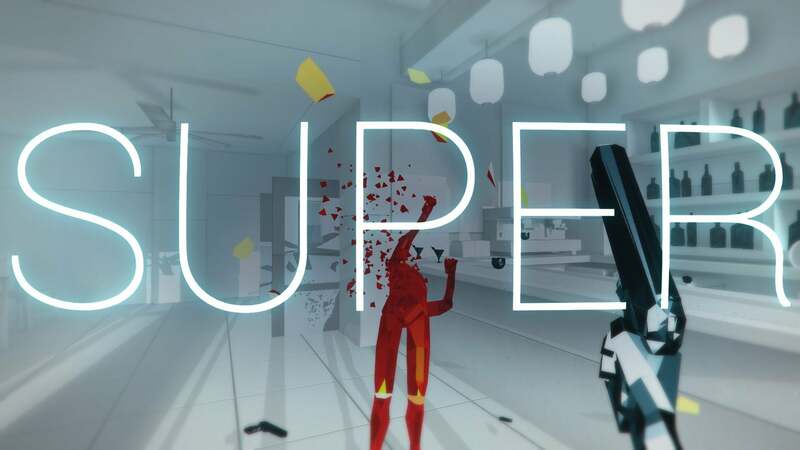 But with just a few pieces Superhot tells a complete story—a tale of betrayal, an “Et tu, Brute?” in one act. It’s a simple story, sure. We’ve no idea where this betrayal began or who the key players are, but it doesn’t really matter. Not for Superhot’s purposes, anyway. There’s also a more traditional framework wrapped around these thirty implied stories. 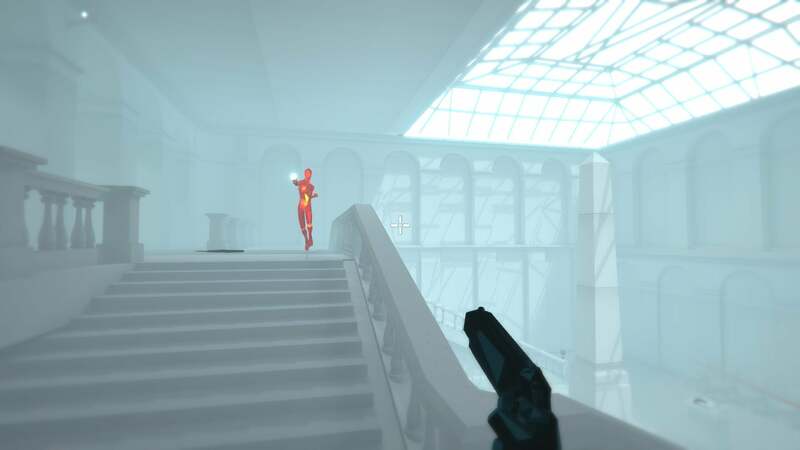 Parodying the way Superhot’s demo originally spread word-of-mouth through the gaming community, the game crafts a meta-narrative about itself. “No idea what you’re talking about,” you respond. It only gets weirder. 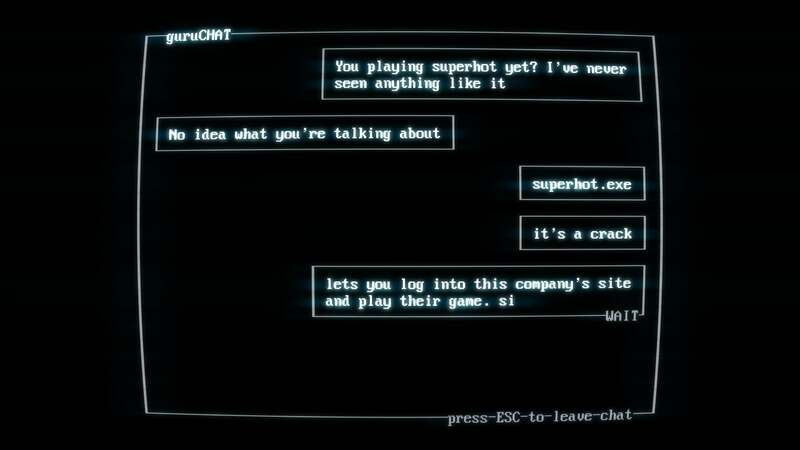 To say too much is to ruin it, but suffice it to say I didn’t expect such concise commentary from Superhot, of all games. Don’t get me wrong—Superhot is still mostly style-over-substance, mostly concerned with making the minute-to-minute action look cool than it is with making grand statements about “Video Games As Art” or some such tomfoolery. It’s dodging bullets and throwing swords and shooting two guys while you float lazily through the air in slow motion. It’s the deep voice yelling “SUPER. HOT. SUPER. HOT.” after a stage is cleared, in a weirdly apropos parallel to the whining noise at the end of each Hotline Miami level. But a surprising amount of story work went on here. The game is short. Two hours, maybe, which is in line with the Portal comparison the devs made in the past. It’s an interesting two hours though, and kept me sufficiently hooked even as the time-stopping gimmick started to grow stale (which for me was about an hour and a half in). Is there enough here? I think so. 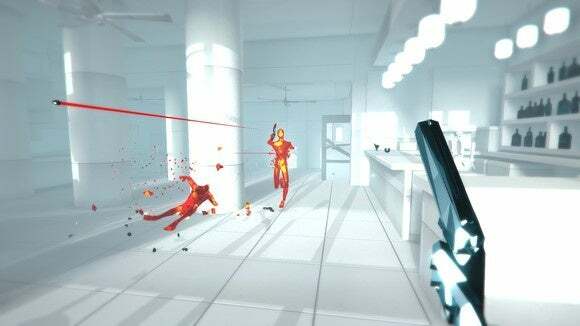 Superhot is a gimmick game, and it was always going to be a gimmick game. I never expected otherwise. But as far as one-trick ponies go this one is pretty stellar, doing its damnedest to make you feel like the consummate badass and leaving you with all sorts of “That was amazing” moments, feats that could never be pulled off at full-speed. Or, at least, not on purpose. And at two hours it gets in, hits hard, and then knows when to get back out again. A rarity, in games. It’s—pardon the cliche—the most innovative shooter I’ve played in years. You’ll have to experience it for yourself to understand. Superhot's time-freezing antics are finally a full-length game. No plot. No nothing. Just killing red guys.